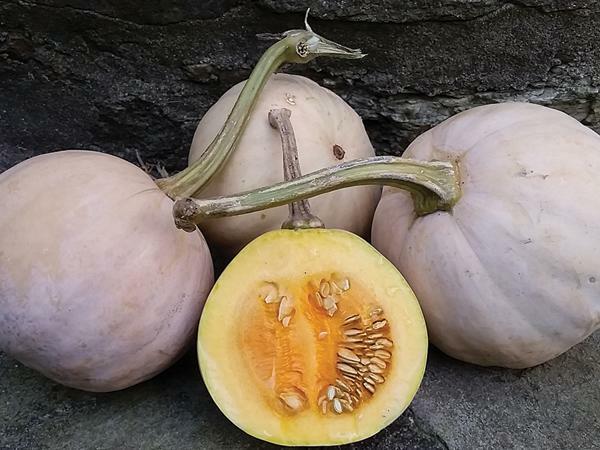 The Quaker Pie Pumpkin was developed among the Quakers of Washington County, New York (hence the name) and then released commercially in 1888 by Philadelphia seedsman W. Atlee Burpee. The original strain featured creamy white skin and weighed as much as 10 to 12 pounds. English Quaker missionaries later took this squash to Africa where it developed into several strains. We acquired the �Mamouza Strain� from Dodoma, Tanzania in 2001 and offer it here for the first time. This sub-variety features off-white somewhat flesh-colored skin and small round fruits weighing no more than 3 to 4 pounds. The flesh is dense, sweet, and has good storage qualities, lasting as long as 6 months. Furthermore the large, over-sized male flowers are ideal for stuffing. Allow 120 days. Grown for the Roughwood Seed Collection at Field�s Edge Farm, Lititz, Pennsylvania.